(Bloomberg) -- For a guy who says one of his fondest memories as a Canadian was watching the Quebec separatist movement fail at the ballot box in 1995, Brett Wilson sure talks a lot about his own province seceding. Wilson -- an occasional panelist on “Dragon’s Den,” Canada’s version of “Shark Tank” -- isn’t alone in that thinking. It’s become a major undertone in Alberta’s provincial election this week and could determine the future of Canada’s energy industry. About 71 percent of Albertans say their province doesn’t receive the respect it deserves within Canada, and 68 percent say it doesn’t get its fair share of federal spending, the highest proportions of any province on both measures, according to a recent survey by the Canada West Foundation, a public-policy think tank. The poll shows western alienation -- the idea that the rest of Canada either doesn’t care about Alberta and Saskatchewan or is actively opposed to their interests -- is real and has worsened in recent years. It has been front and center in the provincial election campaign, in which a conservative who has harsh words for Prime Minister Justin Trudeau is facing off against a center-left incumbent who has occasionally allied with him in order to curry favor for provincial priorities at the federal level. And how Canada deals with western alienation has national and global repercussions. The energy sector accounts for 10 percent of Canada’s economy and 20 percent of its exports. Alberta’s 3.7 million barrels of daily production are more than most OPEC members. And that’s just what it pumps now. The province’s proven reserves of 165.4 billion barrels of oil trail only Saudi Arabia and Venezuela and are enough to supply every drop of used around the world for four and a half years. It’s the lack of awareness of how important the energy industry is -- and the dearth of support for it -- that irks Albertans, said Martha Hall Findlay, a former federal lawmaker from Ontario who now leads the Calgary-based Canada West Foundation. Hall Findlay grew frustrated with eastern Canada’s dismissal of the west during her time in office and says her support for Enbridge Inc.’s Northern Gateway oil pipeline contributed to her loss to Trudeau in the Liberal Party’s 2013 leadership contest. After becoming prime minister in 2015, Trudeau scuttled the pipeline -- an offense that still angers many Albertans. Not to mention much of the province also still holds a grudge against Trudeau’s late father. Former Prime Minister Pierre Trudeau implemented the National Energy Program during the early 1980s, which was fiercely criticized for taking power over the industry away from Alberta. Many westerners also think the federal government is more willing to help businesses in central Canada. They point to the scandal around SNC-Lavalin Group Inc., in which Trudeau is alleged to have pressured his former justice minister to intervene in a criminal case on behalf of the Montreal-based construction company. Canada’s system of equalization payments between provinces, of which Quebec is a beneficiary, is also a particularly sore spot. Ottawa has its frustrations with Alberta as well. Trudeau campaigned on a grand bargain with the west: implementing a carbon tax that would make Canada a world leader in combating climate change in a bid to secure public support for a new oil pipeline. He also extended added benefits to unemployed oil workers and paid C$4.5 billion ($3.4 billion) to buy the Trans Mountain pipeline from Kinder Morgan Inc. to save its expansion. But as crude prices languished below their 2014 highs, Alberta has dealt with persistent job losses and a sense that the boom is gone for good -- and many blame Trudeau. His comments at a town hall meeting in Ontario in 2017 that Canada needs to phase out the oil sands only fueled suspicion that he’s secretly opposed to the industry. Despite the recent rough patch, Alberta remains Canada’s richest province, or among the richest, by any measure. That reality is often difficult to square with protests radiating from the region. Trudeau’s government looked set to advance on many of its environmental priorities in 2015, when the center-left New Democratic Party, led by labor lawyer Rachel Notley, broke 40 years of conservative rule in Alberta. In short order, Notley implemented a carbon tax, capped oil-sands emissions, and started weaning the province off coal-fired power. 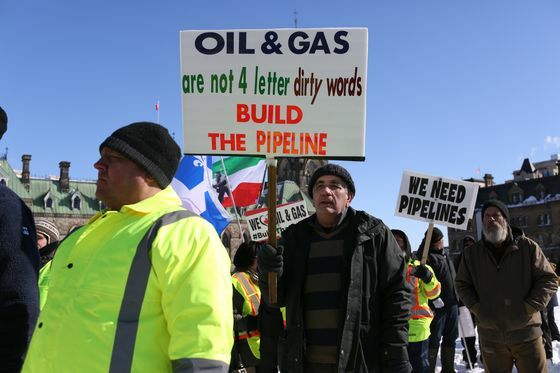 But plunging oil prices, Trudeau’s abandonment of Northern Gateway, Quebec’s fatal obstruction of TransCanada Corp.’s Energy East pipeline, and delays to other export projects through the U.S. have diminished Albertan appetites for cooperation. Momentum has swung back to Alberta’s conservatives, who campaigned on taking a more combative stance with Ottawa and are leading in the polls for Tuesday’s vote. United Conservative Party Leader Jason Kenney is promising to cancel Alberta’s carbon tax, challenge the constitutionality of a federal bill that revamps pipeline approvals and hold a referendum on how much the province pays into federal coffers. 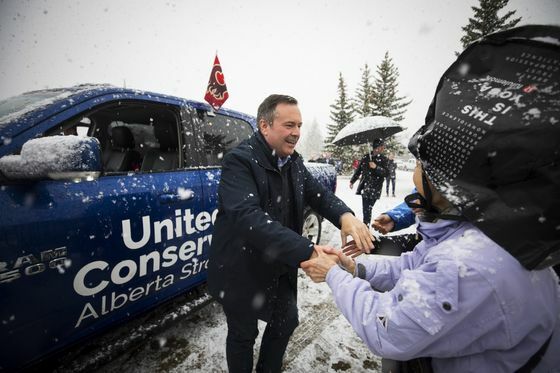 “We must have leadership that will never again be embarrassed about or apologize for Alberta, but will, without relent, fight for it,” Kenney said at a rally in Calgary last week. Notley counters that she has fought the federal government when necessary, forcing it to buy Trans Mountain, and routinely blasts former Prime Minister Stephen Harper’s government, in which Kenney served as a cabinet minister, for its lack of progress on major new export pipelines. For Wilson, Alberta separation has moved from his seventh-best idea for the province to near the top of the list. He wants the government to draft solid plans for secession so that the province has credible alternatives in future dealings with Ottawa.